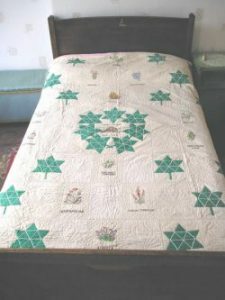 The maternal side of my family emigrated from Yorkshire to Canada in about 1815, things were tough in those days, all self-sufficiency where they grew all their own food and produced most of their furniture and household goods – including, of course, quilts. The tradition of quilt making was passed down the family, my grandmother’s and I expect her mother and grandmother’s quilts were utilitarian. Money and time were scarce and those of my grandmother were made of blocks from scraps or when clothes were worn out the good pieces were used and as I remember mostly tied not quilted. By the time I came along (1926) my mother and her sisters and, of course, the ladies of the church were producing more fashionable quilts. The patterns that stick in my mind were hexagons and Dresden Plate. Mother had a large quilting frame which she used to set up 8′ x 6′ made of 2 x 4s with a vice at each corner and laid on four chairs and I had a lovely time playing under there, it was kind of like a cave and nobody could see what you were up to – it was great! Of course, the frame had to be taken down before father got home and it was stored behind the piano ready for the next day when mother’s 4 sisters would arrive, however, as the work on the quilt progressed and was turned under so my cave got smaller so I really had a short time span under there and no gossip as my mother would point under the quilt if something started to get interesting! I was really not interested in quilting and I didn’t take it up until I was 60. I did not realise what lovely quilts mother and her sisters and the quilting bees at the church were producing. My mother made my son a beautiful dark blue quilt with a large Mariner’s Compass in the centre and four small ones, one in each corner – all done in white – as I still cannot make a Mariner’s Compass, my admiration is boundless. Mother then made my daughter a quilt. It’s pretty shabby now as it was well used. The quilt shown was made by my mother in 1966/67 for the Canadian Centennial and the ten embroidered blocks are the symbols of the provinces, i.e. White Trillium for Ontario. I might say she did not think it was good enough to enter in a Fall Fair, however, others did and she got a rosette much to her surprise! My mother loved doing points, I inherited her quilting books when she died and all the quilts she marked have points – those of you who know me know I don’t do points, isn’t it funny what skills you don’t inherit!